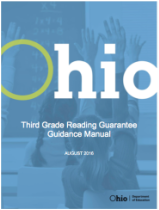 The Ohio Department of Education created this Third Grade Reading Guarantee Guidance Manual to help school districts, understand the requirements of the Third Grade Reading Guarantee. Applies the findings and recommendations of the National Reading Panel to the teaching and learning of reading. Research-based Practices in Vocabulary Instruction: An Analysis of What Works in Grades PreK-12 Prepared by the Studies & Research Committee of the Massachusetts Reading Association.